Tom Cassidy on the set at CNN, mid-1980s. Credit: Courtesy Whit Raymond. For the first decade-and-a-half of the AIDS epidemic, before there were effective treatments, AIDS rewrote the unwritten rules of the closet. Because AIDS was inextricably tied to gay men—the vast majority of those who were struck down by the disease in the United States during this time were gay men—tens of thousands were forced out of the closet as they sickened and died. Tom Cassidy knew the rules of the closet. As he built his career from local TV reporter to CNN business news anchor and host of that network’s “Pinnacle” series, Tom kept his gay life and his professional life strictly separate. And then he found out he was going to die. 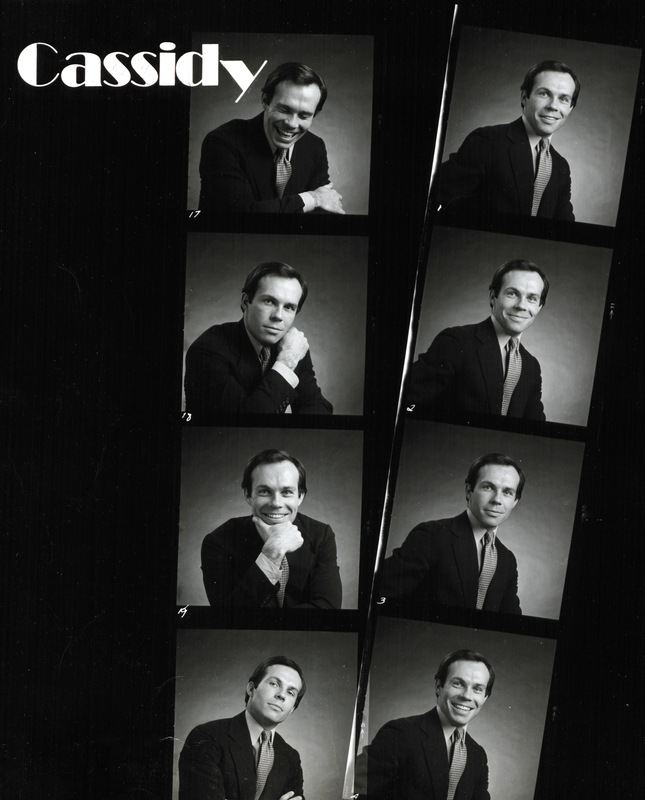 Tom Cassidy contact sheet, early-1980s. Credit: Courtesy Whit Raymond. Unlike some gay men diagnosed with AIDS whose high-profile careers led them to disappear from public when they became seriously ill, Tom Cassidy chose the opposite course. He decided to bring his experience into the living rooms of viewers through a three-part television series produced by journalist Mike Taibbi for WCBS-TV, New York City’s CBS affiliate. To learn more about Tom Cassidy and the AIDS epidemic, please have a look at the resources, links, and photographs that follow below. Tom’s appearance in the WCBS-TV three-part television series led to many additional media interviews, including this article in People magazine. You can find Tom Cassidy’s oral history in Eric Marcus’s book Making Gay History. The New York Times published Tom’s obituary on May 29, 1991. 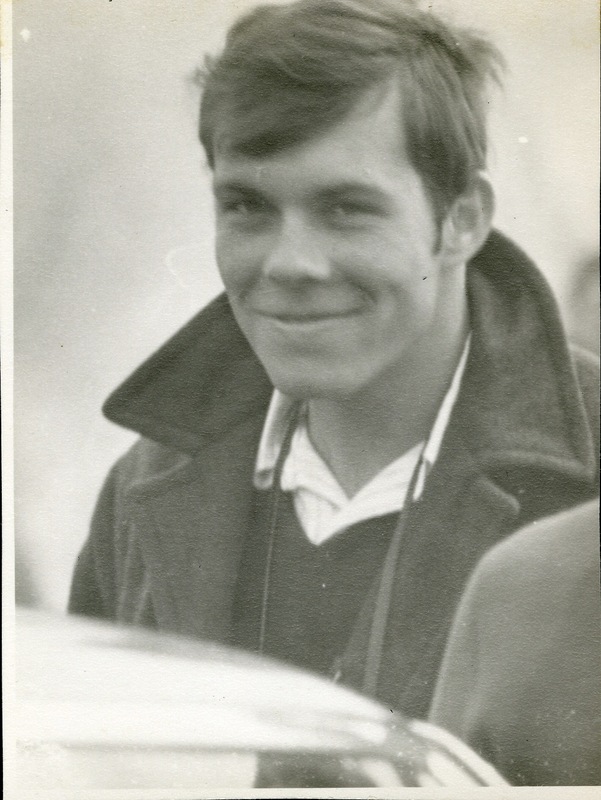 Tom Cassidy at rowing regatta, Princeton, New Jersey, 1971. Credit: Courtesy Whit Raymond. Tom left money in his will to Bowdoin College to establish the Tom Cassidy Lectureship in journalism, which continues to this day. Guest lecturers have included Tom’s former boss Lou Dobbs, NPR’s Linda Wertheimer, and David Brooks of the New York Times. In the same year that Tom came out about his AIDS diagnosis, a former KGO-TV reporter in San Francisco, Paul Wynne, sold his one-time employer on the idea of producing a weekly chronicle of his life as an AIDS patient. You can read about Paul and the series here. You’ll find his New York Times obituary here. Author Larry Gross provides a solid overview of LGBT people in relation to mass media (prior to 2001) in his book, Up from Invisibility: Lesbians, Gay Men, and the Media in America. NLGJA (originally knowns as the National Lesbian & Gay Journalists Association) was founded in 1990 by openly gay newspaper editor Roy Aarons. It’s an organization of journalists, media professionals, educators and students working from within the news industry to foster fair and accurate coverage of LGBT issues. NLGJA opposes all forms of workplace bias and provides professional development to its members. To learn more, click here. To learn more about the AIDS epidemic we recommend the following two books: And the Band Played On by Randy Shilts and How to Survive a Plague by David France. David France also directed a documentary of the same name. Tom Cassidy was a total alpha male. Athletic, smart, in charge. And proud of the way he’d worked his way to the top despite growing up poor in a Boston housing project. His alcoholic, abusive father abandoned the family when Tom was two-and-a-half. Tom Cassidy as a freshman at the University of Massachusetts, 1967. Credit: Courtesy Lorraine Potts. 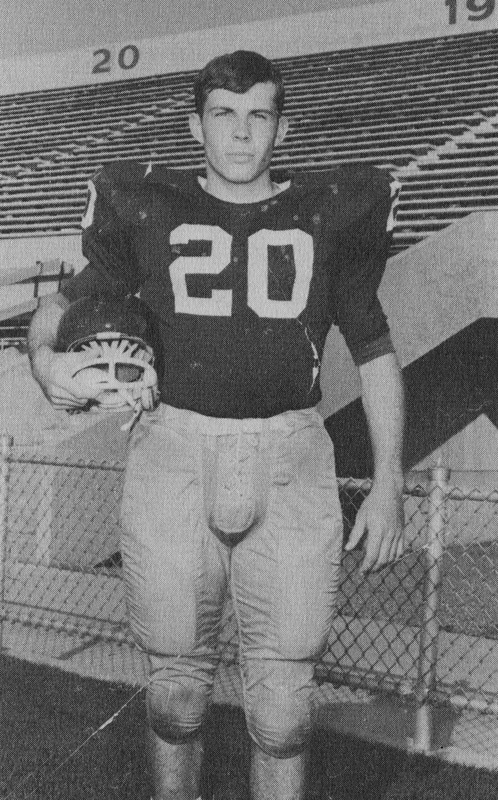 Tom earned a football scholarship to the University of Massachusetts and after his freshman year muscled his way into Bowdoin, an elite liberal arts college in Maine. He followed four years there with joint masters degrees in business and journalism at Columbia University. And then he set his sights on TV journalism. By 1983 Tom was a rising star at the three-year-old Cable News Network where he was a business anchor and host of CNN’s “Pinnacle” interview series. He had status, respect, and financial security. And he loved his job, even though that meant hiding the fact he was gay. Back then, almost all gay people who worked in journalism—and virtually everyone who worked in front of the camera—kept their private lives very private. 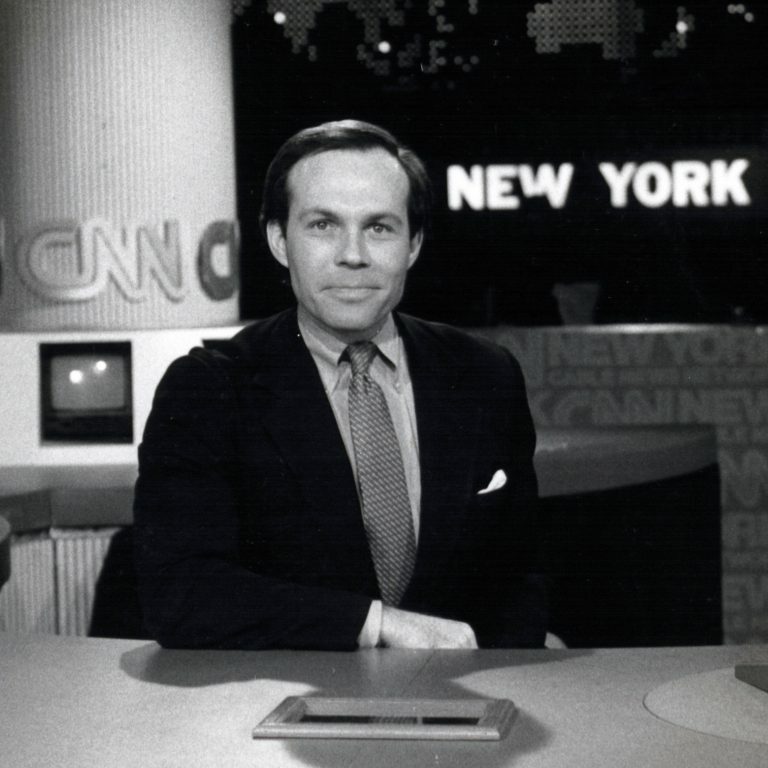 Tom’s peak professional moment came on October 19, 1987 when he anchored CNN’s coverage of the Black Monday crash as stock markets around the world plummeted. It was the single largest percentage drop for the Dow Jones Industrial Average in its history. And Tom provided a calm, steady voice on a day when both were in short supply. It was also the day he found out he was HIV-positive. So here’s the scene. It’s the fall of 1990. I arrive on the 20th floor of CNN’s headquarters in New York City. The newsroom is buzzing. I’m escorted to Tom’s private office by an assistant. He steps from behind his desk and shakes my hand, which disappears into his. Tom looks older than he does on television, but knowing he’s had two close brushes with death I’m surprised by how good he looks. At 41 he still has the solid build of a college football player and a boyish, disarming smile. His face is lined and a bit gaunt—the skin tight around his well-defined cheekbones. His brown hair is thinning, but his blue eyes dazzle. I’m just a little bit smitten. Tom motions for me to close his office door and sinks into his padded chair. I reach across his desk and clip my microphone to his tie. He gets a few coughs out of the way before I press record. Eric: Tom Cassidy at CNN in New York City. Interviewer is Eric Marcus. Tape one, side one. Tom: It had become crystal clear to me that I was in love with my roommate. And we talked about it. Eric: Your roommate was straight. Eric: Was he also a football player, also? Tom: Yup. He was football, hockey. He was a very good athlete. Yeah. Whit. Eric: How’d you break it to him that you were in love with him? Tom: I just told told him that essentially. And he was very understanding about it. Eric: Was he the first man you fell in love with? Tom: This was a mature, a maturing love that I was feeling for the first time. Eric: As opposed to a crush. Tom: Yeah, I’d say so. Eric: That must have been very frustrating. Tom: It was very frustrating. And when we graduated, he hoped to go to medical school. So I just left altogether and I went to Europe for almost a year and just traveled. Eric: What did you find? 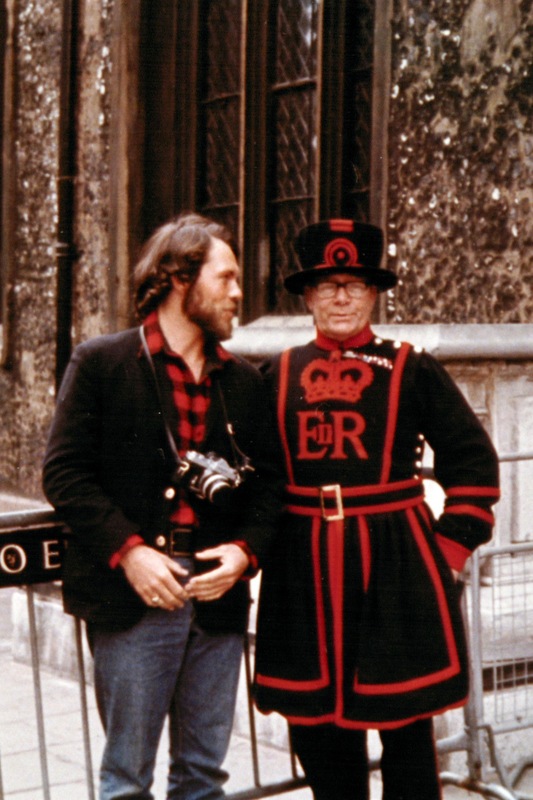 Tom Cassidy, London, 1972. Credit: Courtesy Whit Raymond. Eric: Was it the Catholic god come to…? Tom: Well, maybe a little guilt, but it’s a guilt that’s mixed with excitement, you know. And that had been really the first time. Unidentified person: Hi, I’m sorry to interrupt you. Tom: I gotta’ do an update. Eric: Um, so you came back. Tom: Um, humm. I moved here to New York and I went to work for Reader’s Digest, the publishing side of Reader’s Digest. I really thought all the fun was being enjoyed on the editorial side. But I wasn’t prepared for it. I decided that I would go to graduate school in the business school at Columbia and also the Journalism school at Columbia. 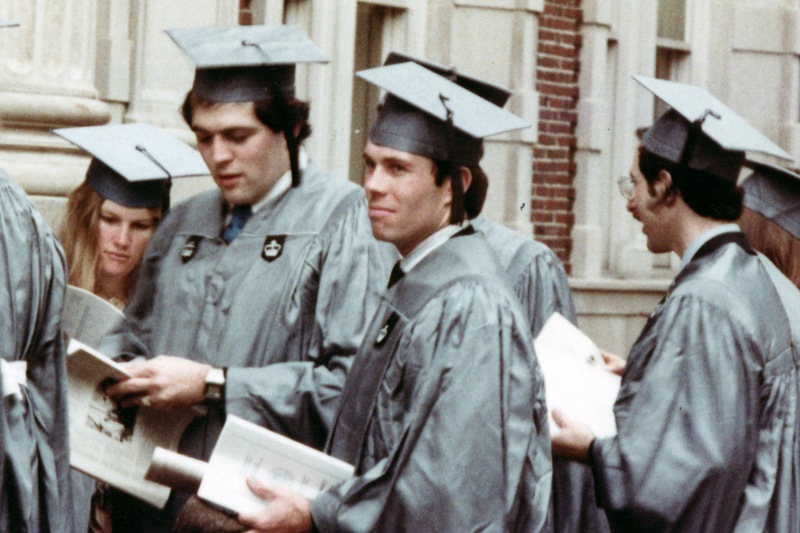 Graduation day for Tom Cassidy, Columbia University Graduate School of Journalism, New York, New York, 1978. Credit: Courtesy Whit Raymond. And at the time, I got involved with somebody, John Woods, ge was twelve years older. He was an illustrator. And he was real jet-set New York. And it was just a blast. John was somebody I had known for five years when I graduated from the schools. And my choice was Eugene, Oregon, or Butte, Montana, to get started in television news. I go to Eugene, Oregon. Nine months later I go to San Francisco. Nine months later I go to Chicago. Right when I landed in Chicago, you know, John took the wrong person home and he ended up having a dreadful death. He was murdered. Eric: And he was still your lover at that point? Tom: Well, we talked all the time, yeah. He really kind of was. We were very close. We talked a lot. It happened about two months after my mother had suddenly died of a stroke. I had lost the two most important people in my life. Eric: Did he know who he was to you? Tom: No. So I just turned around and I said, “It’s not negotiable,” and I walked out. And I went to Duncan, Oklahoma, where John was buried. And I was right between the mother and father. Eric: They knew who you were to him. Tom: Yeah. They did, although it was never really discussed, yeah. Then I just sort of came back to Chicago and was the business editor for Mutual Broadcasting in WCFL there. I couldn’t grieve in any public way. And I was in shock and I couldn’t talk to anybody about it. Eric: How hard was it to stay in the closet then at work? Tom: It wasn’t difficult for me at all. I almost have felt like I have a mechanism that I can really separate work from play. And I did not… I made a point of not really socializing with people that I worked with. Once you make a decision and you get a habit down. Eric: And you were good at it. Tom: Very good at it. Eric: When did you first think you had AIDS? Tom: It all happened kind of quickly. I tested positive the day of the stock market crash in ‘87. Tom: Right. And then I started to have to think more about it, what all this meant, testing positive. 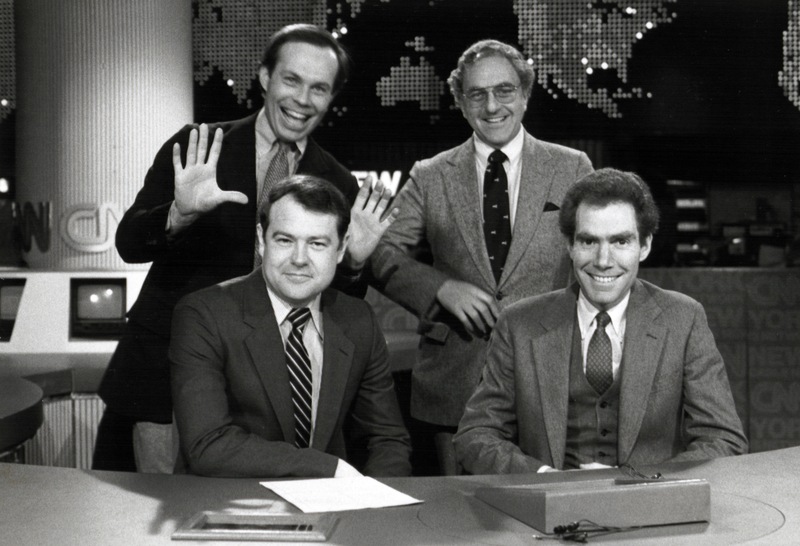 Tom Cassidy having fun with CNN colleagues, mid-1980s. Courtesy: Whit Raymond. Tom: Yeah, kinda, because I felt good and I was traveling 200,000 miles a year and being the attack dog reporter here in the money market area. And I was just going full speed. And I eventually had pneumonia in July. Eric: And you couldn’t come to work with that. Your life changes in such fundamental ways when that word comes to you. I felt terrible, terrible! And I was a jock and I had never felt terrible. Eric: How long were you in the hospital? Tom: Sixteen days. I mean these fevers were unbelievable. Eric: You must have been scared. Tom: I was scared. I was scared in that I wasn’t prepared to die. It was such a shock. And it was kind of rude. It really was. I mean I hadn’t said goodbye to anybody. Nobody knew what the situation was. Eric: It wasn’t your time. Tom: It wasn’t my time. Exactly. And I’m certainly supposed to not just suddenly die. Eric: Because it was making you so sick? I went into the emergency room. And as it turns out my pancreas was six times normal size. They did not know for the next six days whether I was gonna make it. You can’t eat or drink a thing and your pancreas makes up its mind whether it wants to live. Eric: So how did the truth make it’s way out? Tom: Well, that was actually kind of funny. Eric: Because none of this is funny. Tom: It isn’t, but I always had a good sense of humor. Tom: I’ve always had a good sense of humor. Before I left for the Mt. Sinai emergency room, like a responsible reporter, I had called the assignment desk and said I would not be in tomorrow. This message for some reason got lost. So, on Monday, they can’t find me here. They called the police. They called the FBI. They ended up calling morgues. Then they called my sister. And my sister calls my college roommate. 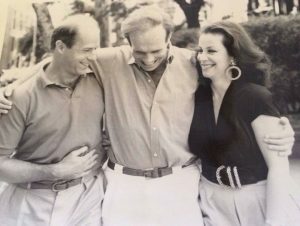 Tom Cassidy with his friends Whit Raymond and Betsy Schaper in New York City, 1990. Credit: Courtesy Betsy Schaper. Eric: With whom you’re still friends. Tom: Very much so. And he was one of the few people who did know I was sick. And he remembered that when I was sick the first time with pneumonia, I was in Mt. Sinai. And Whit calls me in the hospital and I answer the phone. I said, “Hi Whit, how are ya?” And he goes, “What am I supposed to tell Lorraine?” My sister. And I said, because I was hurtin’, I said, “Tell her everything. Everything!” And he said, “Are you sure?” I said, “Uh, huh, yeah.” And, so, he told her and she called me twenty minutes later. She was great. Eric: When did they find out here at the office? Eric: Were the beads of sweat on your forehead at that point? Tom: Yeah. And I said, “Well, I was pretty sick.” And he said, “Well, how sick?” I said, “I was very sick.” And he said, “How sick?” And I said, “Well, I have AIDS.” And his eyes just sort of rolled back. It was very much a feeling of relief for me, because Lou Dobbs is clearly one of the most important people in my life. Almost, clearly a brother figure. 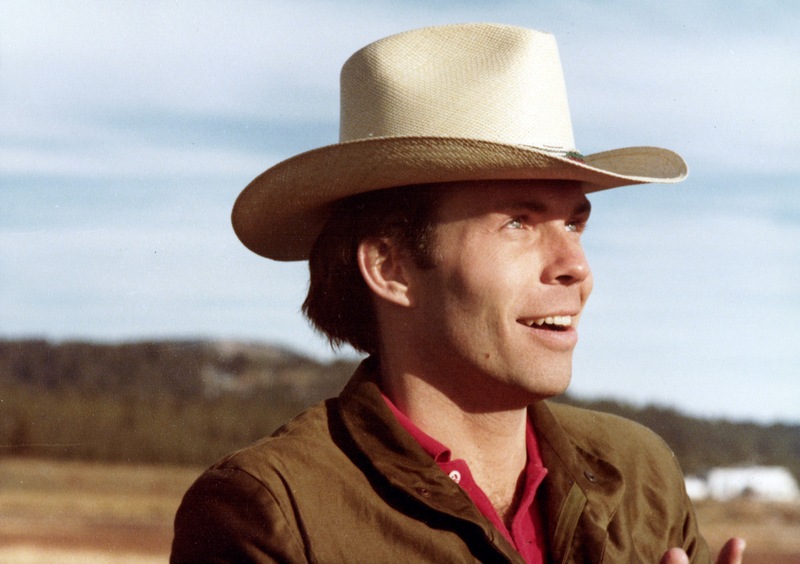 He’s a western cowboy, a macho homophobe, who was really a very good friend of mine. And I was afraid of what his reaction would be. Eric: Because of the AIDS or because of being gay? Eric: Why at that point? Tom: I was tired. I was tired of living a lie. Tom: And also about being gay. Because they were intertwined at that point. And he scheduled a meeting for the whole department. And he told them. I wasn’t around. Eric: That must have been very hard. Tom: It was very hard for him. Eric: For you, as well. Eric: Or was it simply comforting? Tom: It was almost comforting. Eric: Did they surprise you? Eric: What did you expect? Eric: What did you fear? Tom: Because I had AIDS, first of all. That’s not an easy message to get and to be around. Eric: And you’re a prominent figure within the company. Tom: Very prominent, yeah. And I’ve been here a long time. And I came in the next day…and…you know, there were flowers… and mass cards… and a lot of messages. There was a lot of love. And my life hasn’t been the same since. For the last two years I had lived a very difficult, fabricated life. I used to have to sneak home sometimes and lay down during the day when I had some time off. Eric: So you had a double closet. Eric: It was not as if you had some disease that you could extricate from the fact you were gay. Tom: Right. Plus, I mean, I could… I suddenly became very tuned in to what was going on with the plague and it wasn’t lookin’ good. And I had to think about dying. I’m still trying to figure out, like a peripatetic reporter, what happens next. I mean, when you close your eyes, I mean, take your last breath, what happens? I haven’t gotten figured out. Eric: You can’t take a notepad or a television camera so you can… It’s all on your own. Tom: You know, you don’t hear from people… I don’t hear from people that have passed away. So I don’t know. It’s kind of intriguing, in a way. Eric I wonder if there are gay people in heaven. Tom: Oh, I think so. I think so. Maybe heaven is one big gay bar. Tom Cassidy had reason to be surprised by how his colleagues rallied around him. It was 1990, and effective treatments for AIDS were still years away. Back then many people were actually afraid to be around someone who had AIDS. Tom had a chemotherapy infusion following our interview, so I rode along with him to his doctor’s office on the Upper East Side. As soon as we left his office at CNN, I could see how unsteady he was on his feet, but I really resisted taking his arm because I knew he didn’t want anyone’s help. At 85th Street we parted with a hug. Tom said to stay in touch. In my notes from that day I wrote, “I wonder how long he has.” It turned out he had seven months and I never saw him again. Tom Cassidy died on May 26, 1991. He was 41 years old. Tom’s name lives on at Bowdoin College where he endowed an annual lecture series that brings working journalists to the school’s campus. 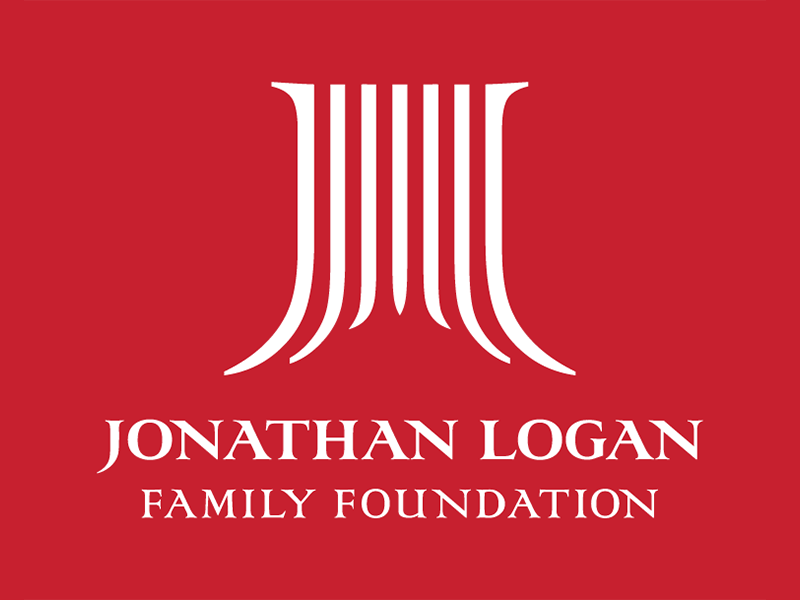 The first lecture was given by Tom’s CNN boss, Lou Dobbs, and in the years since speakers have included NPR’s Linda Wertheimer, David Brooks from the New York Times, and Ben Bradlee and Sally Quinn from the Washington Post. This is our final episode of Season Two, so please stay tuned for Season Three, coming this fall. To get the latest news on our plans for Making Gay History and upcoming events, please sign up for our newsletter at makinggayhistory.com. That’s also where you can find photos and additional information about Tom Cassidy and where you can listen to all our previous episodes. I just got through listening to your podcast on Kay Lahusen and Barbara Gittings. You closed with a reference to Kay’s question “What do you have for me?” Well, here’s something. I am the proud father of a beautiful young woman named Annika. She is 17 years old and dating a most spectacular young lady. She is totally at ease with who she is, quite open about her life, her love and personality. Indeed, she and I just finished shopping for a prom dress in anticipation of when she and Mattie go to the prom this spring. I have to credit the work and bravery of Kay and Barbara for that. Here, in of all places, Laramie, Wyoming, my daughter loves another young woman and she is totally at ease with that. Tell Kay thank you for me, for Annika and for Mattie. 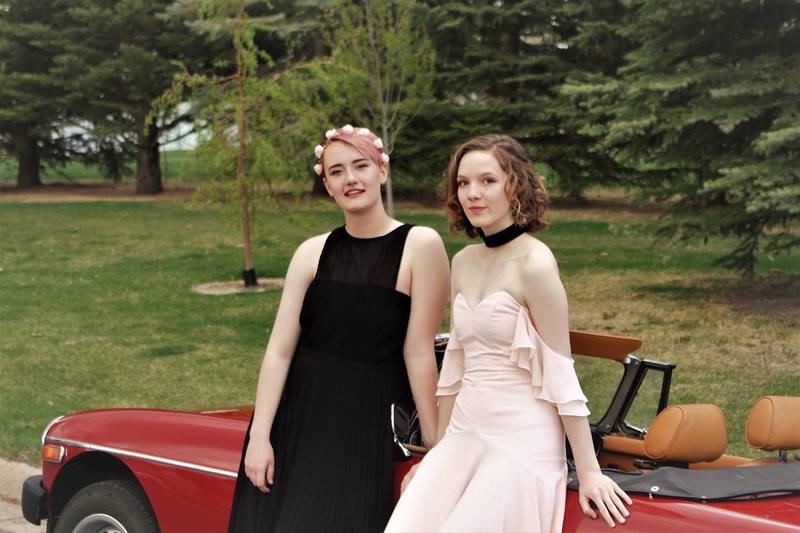 Annik (right) and Mattie on their way to their senior prom in Laramie, Wyoming, May 6, 2017. Credit: Charles Pelkey. Kay loved all the emails, which I read to her by phone and she asked me to thank you for your thoughts and love. And feel free to keep them coming. Write to me at hello@makinggayhistory. I’m beyond grateful to the many people who have made Making Gay History possible. Thank you Kevin Jennings for the Arcus Foundation grant that got us launched. We’re grateful, as well, to Barbara Raab, a program officer at the Ford Foundation, who made the funds available for Making Gay History’s second season. And then there’s our crew. Sara Burningham, our executive producer, always finds a way to make the Making Gay History voices sing. Jenna Weiss-Berman, our co-producer from Pineapple Street Media, believed in us before we believed in ourselves. Thank you also to audio engineer Casey Holford; researcher Zachary Seltzer; our website designer Jonathan Dozier-Ezell; and social media strategist Will Coley. Our theme music was composed by Fritz Myers. And finally, thank you to my partner in life, Barney Karpfinger, who never doubted that the little podcast that could, could. 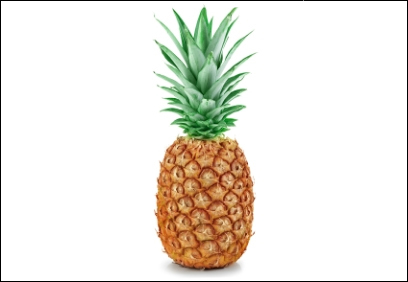 Making Gay History is a co-production of Pineapple Street Media, with assistance from the New York Public Library’s Manuscripts and Archives Division and the One Archives Foundation. 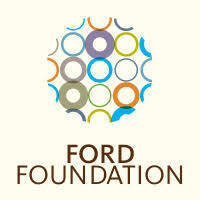 Season Two of this podcast is made possible with support from the Ford Foundation, which is on the front lines of social change worldwide. So long. And we’ll see you in the fall. Tom: 1275. Tom Cassidy from CNN. 5 Penn Plaza. 85th and Park—85th and 5th. 7147907. Yes, okay, great. Thank you. Now I have to go take some real serious drugs. Tom Cassidy in an undated photo. Credit: Courtesy Whit Raymond.